“Iconic to many. Lived by a select few”. Start date: August 27, 2003 in Seville (Andalusia. SPAIN). A group of enthusiasts people at SAAB car manufacturer in Andalusia (SPAIN) began regular holding from the start date of activity. Write your comment and contact us. Let us hope this will be the best SAAB event this year in Sweden. The the event focuses on SAAB´s but any other great car is welcome. See other Saabs meet with people for MapTun, SaabsUnited and various vendors. So mark the day as a car day in Your calendars. Örebro is easily accessible for most people in sweden. Right in-between Stockholm and Gothenburg. CEO Fredrik Bengtsson of MapTun welcomes You all to an exciting car day with some great surprises! Last Sunday in Italy (Friuli district) an annual gathering of 900 OG convertibles took place. This year only six beauties turned up. At last year’s meeting more than 20 retro convertibles attended. All belong to longtime owners who know each other. Organizers of the meeting of the club were SAAB 900 CABRIO AMATORI TRIVENETO. First up was a trip through the local beautiful places. The Italian sun is well suited for a open roof drive. The young organ player let us practice a few chords. Where Saabers gather, sweet music ensues. Passing cars saluted us with a solid blast of their horn – their passengers all waves and smiles. Saabs on ice in Norway! Last weekend (13th-15th of February) the classic Saab club in Norway, “Gammalsaabens venner” (GSV), had their annual winter-meet on a ice track. The track is located in southern Norway, at Dagali, approximately 220km Northwest from Oslo. GSV was from the beginning a club for the two-strokes, later all cars older then 21 years were welcome, and for a few years ago all Saabs are welcome in the club. I got this text and some awesome pictures from one of the attendants, Oscar Emil Lea. Thanks for sharing this with us! The weekend started Friday evening when people start showing up, for a dinner and company into the evening. Saturday we met at the ice-track at 9:30 in the morning and prepared the cars for driving. Some put special tyres with serious studs like they use in rally, other used their usual road-legal tyres with or without studs. At 10:00 the driving started with the smell of two-strokes and the sound from tuned V4-engines. At this point you could drive as you wanted around the track with no program, and took place in “Øvre Svangtjørni” at the river “Numedalslågen”. The track is a machined ice track that was made a few hours before arrival and had several hairpins, chicanes and some great stretches. The speed was high and the “fun-factor” was at top! At 12 o’clock was it time for the traditional “Ice-track soup”, rolls, coffee, hot chocolate and a quiz. After a hour break the skill driving started. This was at a different track, and the run consisted of slalom up to a roundabout and round it and park in a “garage”, then we was reversing the same way and end up parking in the “garage”. The cars was divides into three classes; rallystud, stud and studless. Later this evening there was a common gathering a the local hotel with dinner, prizes for the winners from the quiz and the skill-driving and good company into the evening. In total there was approximately 20 cars on the track during the weekend, all from two-stroke to a 2010 9-3. Sunday is as always a day for breakup and departure after breakfast, but it isn’t more then a year until next time! It was 10 AM on a Saturday morning (September 6th, 2014 to be exact), at the center of a usual quiet weekend in the Santa Clara high-tech office park that was not even disturbed by the newly constructed football stadium. Yes, it was a quiet morning indeed. But, that was about to change: more on that later. The first item on our itinerary was a visit to the European Auto Factory. We observed various models: including 9-3s, 900s and of course the venerable Sonett. After nearly an hour of mingling, the quite air was filled with pistons firing and Turbochargers whistling: the 2014 San Francisco Bay Area Saab Club Meet and Drive was now on the move! 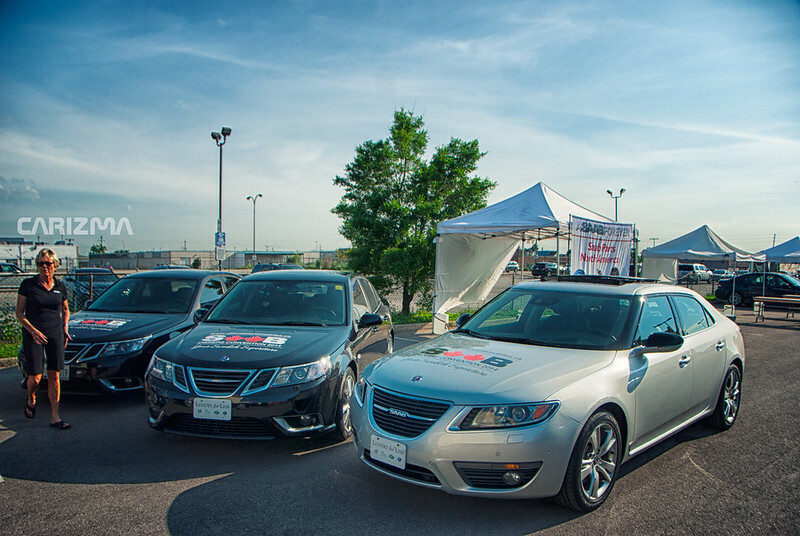 We had a wonderful inaugural Canadian SAAB Owner’s Convention in Toronto, Canada this weekend. We are grateful for the support of SAAB owner’s from all over Canada as well as those who traveled from as far as Kansas, Wisconsin, Missouri, Rhode Island, Illinois, Michigan, Pennsylvania, New York and New Jersey to name a few from the United States. Without your support, this event would not have been a success as you have made it. Peter Backstrom. We were honored that he was able to join us for this convention. There were many great cars from vintage to the current new generation 9-5. SAAB owners have an overwhelming pride in their cars. Too many pictures to include in this post, though. Novus Tech, Concours Touch Auto Detailing, SAAB Club of Canada, SAAB Club of North America and NINES Magazine, Aktive Motors, BOOST Customs, Hot Rod Scott’s, and ONPOINT Dyno & Race Service. This convention was organized as an opportunity for SAAB owners to get together to share their love and passion for this iconic brand. In the process, friendships were made that will last a lifetime. The SAAB community has weathered a tough few years. The brand is as unique as its owners and for some, their loyalty is immeasurable. Thank you again to all who attended. Hope you had as much fun as we had in meeting all of you.